A chance to witness this enthralling spectacle that draws thousands of people year after year with its magical atmosphere. 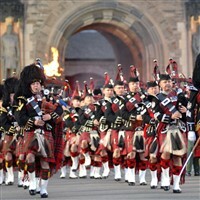 The Edinburgh Military Tattoo, a unique display of massed military bands, pipes and drums an event never to be forgotten, enhanced by its beautiful surroundings in the Castle Esplanade. We depart from your selected pick-up point and join your tour coach for the journey north, crossing the border and onto Moffat for lunch. Arrive at your hotel late afternoon time to relax before dinner. After a leisurely breakfast, late morning departure for Edinburgh, time to see take in the sights of this magnificent city before our evening visit to the Tattoo. Please note: Coaches are not allowed up near the Castle arena during the Tattoo so passengers have to walk to and from the coach pick-up and set down area. Only registered disabled passengers with booked seats in the disabled areas can pre-book a taxi in advance to take them closer to the Castle entrance - late return to hotel after Tattoo . Sadly our last Scottish breakfast as we must then bid a fond farewell and begin our return journey home with comfort stops enroute. · Tattoo Tickets (performance to be confirmed). Itinerary maybe subject to change due to allocation of Tattoo Tickets which are not confirmed until June 2019. Originally built for the Murrays of Blackbarony, this imposing 16 century tower house has evolved into the modern, welcoming hotel of today. Set in 25 acres of stunning grounds which include the Yew Tree Walk and Lime Avenue. The hotel has an indoor pool and fitness centre and all rooms include tea/coffee making facilities, TV, hairdryer and iron/ironing board, complimentary WiFi. From your selected pick-up to join your tour coach for the journey north, crossing the border and onto Moffat for lunch. Arrive at your hotel late afternoon time to relax before dinner. Please note: Coaches are not allowed up near the Castle arena during the Tattoo so passengers have to walk to and from the coach pick-up and set down area. Originally built for the Murrays of Blackbarony, this imposing 16 century tower house has evolved into the modern, welcoming hotel of today. Set in 25 acres of stunning grounds which include the Yew Tree Walk and Lime Avenue, the hotel has an indoor pool and fitness centre and all rooms include tea/coffee making facilities, TV, hairdryer and iron/ironing board, complimentary WiFi.